What Does a Root Canal Accomplish? When you think of a root canal, you think of dental pain. The truth is, with today’s advanced technology, innovative sedation options, and your dentist’s high level of expertise, the procedure is much less painful than you think. The actual toothache you’re already dealing with is what causes your discomfort, not the procedure at all. In fact, your root canal can relieve that pain and help your smile restore its stability and health again. What’s It Like to Receive a Root Canal? Your dentist will use a dental x-ray to see the inside of the affected area, then accesses the inner chamber of the affected tooth with a tiny dental drill. Then, your dentist will meticulously remove all bacteria, the diseased pulp and its nerves from the infected tooth. When your tooth has been cleaned out and all infected areas removed, we seal it closed to prevent any other problems from happening in the future. The final step is to cap the tooth with a natural-looking dental crown. This improves both your oral health and appearance. No one will be able to tell you’ve had a root canal! What Do You Do After Your Root Canal Procedure? After you’ve had your root canal performed in our office, you can expect the tooth to feel sore or tender the following few days. 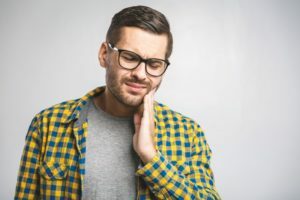 After several days of recovery, prescribed pain medication, and helpful advice from your dentist, the discomfort from the healing process will subside. Brush and floss your teeth as normal to keep the rest of your smile healthy and affected area clean. Wait until numbness subsides to eat anything solid. If you’re experiencing discomfort related to your decayed or damaged tooth, don’t put off the inevitable—contact your dentist today to get the care you need. Here at Horsham Dental Elements, we know that dental pain is no joke. If you’ve got questions about what could be causing your dental pain or how to address it, it’s best to schedule a visit with our office right away. You can also contact us by phone at (215) 672-6666. We look forward to helping you feel great about your smile again!